It’s time we rediscover the bookstore, for real. There’s something magical about them: they’re doorways to discovery, dreaming, new possibilities. They’re not just about expanding your head: they’re about expanding your psyche, your soul, maybe even changing your life as a whole. Daunt Bookstore in Marylebone, image via Daunt Books. More than that, they’re a safe and (when done right) a pleasurable place to explore for the mind and body. There’s the variation and diversity of books; the variation in covers, sizes, the textures, and once you open them, the color and feel and weight of the pages, the choice of type; the ability to let your full set of senses and instincts decide what to pick up and buy; the dark corners; the window bays; the iconic bookstore cat. That pure physicality clearly touches some internal chord within us all: why else would interior and restaurant designers fill clubbier bars and eateries with books bought by the meter or yard? (“Want to warm up a space? Just add books.”) It reeks of inauthenticity but it certainly makes the point. Then there’s the promise and pleasure of serendipity and surprise: the chance that you can be browsing your favorite thriller/self-help/British naval history section, turn around, and find yourself pulling out a tome on Edie Sedgwick or Lee Miller, or even finding that book you’d always wanted to read by M.F.K. Fisher. Maybe it’s finding yourself confronted with whole new worlds: the history of the world in 12 maps or manga, which frankly you’ve never quite understood but have always had a secret fascination. It’s the intellectual equivalent of doing what we do in our twenties (before Match and Tinder) when we’re looking for love: every outing is ripe with possibilities, every corner we turn or stranger we sit next to could change our lives. But much as we like to say we love books and bookstores, the evidence indicates that we don’t, or more correctly, that not enough of us do. For a good decade and a half, bookstores have been suffering, failing, closing. First it was the Big Box Book Store until they began to falter. Then it was Amazon, which will be opening its second brick and mortar store in 2016. There are faint glimmers of light out there (more bookstores opened last year than closed, ebook sales are down) but it’s still tough out there. So the tough have gotten smart and scrappy. Still others have made a name for themselves for amazing service and staff, with encyclopedic knowledge and true expertise like the vaunted Daunt in London. Then there’s the idea of going seriously upscale: witness Assouline – a publisher, not a retailer – has created Maison Assouline, an ultra-luxe space in London to bring its fashion and design content to life. It also features a bar, a specially collection of hand bound books, a curated collection of vintage books, and a bespoke bookbindery. Some have focused less on content than on environment. 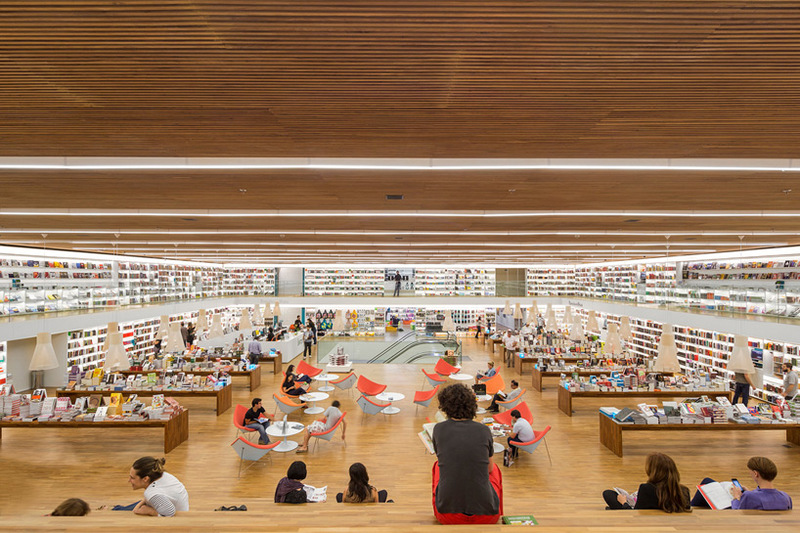 Stores (notably outside of the English speaking world) are rethinking bookstore design altogether, putting them inside churches, or creating stadium style seating for a bookstore to recapture the days of lounging and studying on stairs at school. There’s even an example of a bookseller who’s taken things in another (and similar genius) direction. For the take of the design and architecture community (specifically Gensler, 20.20, Burdifi­lek and Coffey Architects) on reinventing the bookstore, look here, courtesy of the Economist Intelligent Life. We propose a radical resolution for 2016: rediscover the independent bookstore as it rediscovers itself. And please, like we always say, buy from them, too. This entry was posted in BOOKS, Box 1, CONSIDERED PLEASURES, IDEAS, THE RITUALS and tagged Assouline, bookbinding, books, bookstores, Coffey, Collecting, Daunt, Economist, Gensler, HennessyIngalls, London, Los Angeles, MFK Fisher, Mysterious Bookshop, New York, New York Times, Omnivore, One Grand, San Francisco, William Stout. Bookmark the permalink.